While the sobriquet of Garden City may be fast losing its sheen, the garden of Priya Mascarenhas gives us hope that all is not lost. Did you know there is a heritage home in Namma Bengaluru that has won multiple awards for the best garden continually for over 42 years now? Even the home in which this garden is housed has won the Indian National Trust for Art and Cultural Heritage (INTACH) for the best heritage home in the private residential category in 2016. When you visit Priya’s beautiful heritage home, the first thing that will strike you even from the outside is the canopy of green that had an instant calming effect. Being located in one corner of a dead end road, there is a nice green patch on the outside as well that is a perfect precursor for what to expect inside. Priya’s garden is spread over a whopping half an acre and is organized into smaller sections – based on shades of green and types of plants. There are all kinds of ornamental plants and a whopping 25 kinds of fruit trees including the likes of mango, butter fruit, bread fruit, chickoo, figs, guava and native ones like bimbli. “I do not like manicured and stiff gardens. 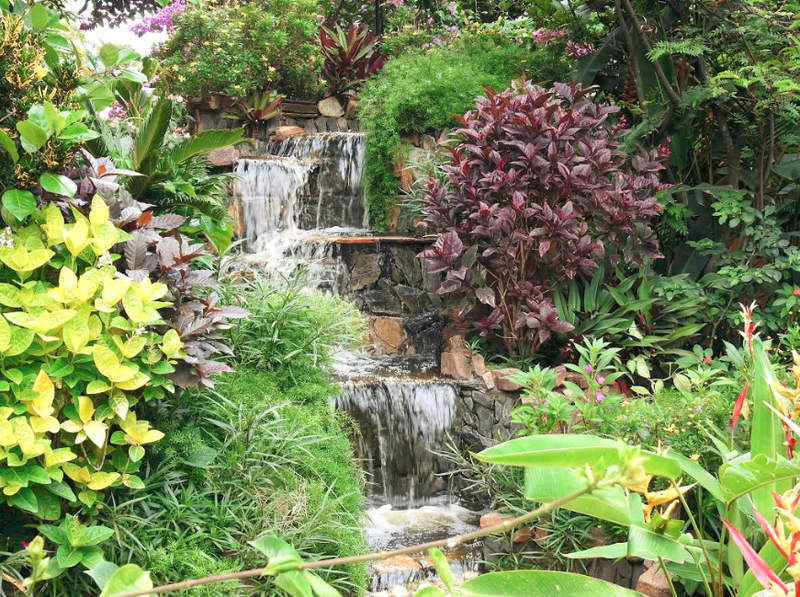 I believe that the garden must flow and while I have lawns, there are several elements whether it is fountains, a waterfall or a bridge that adds to the overall look and feel of the garden. Also my daughter Champa is a special child and she loves spending time in the garden especially around the water. In fact the water has been therapeutic for her,” explains Priya. Her garden always wins the prize from Lalbagh on the occasion of Republic Day and Independence Day and as you walk around you know exactly why. The gardens itself are stunningly beautiful interspersed with interesting accessories, masks, white benches, white wood dividers and more. A gazebo area is also part of the garden and is surrounded with potted plants. 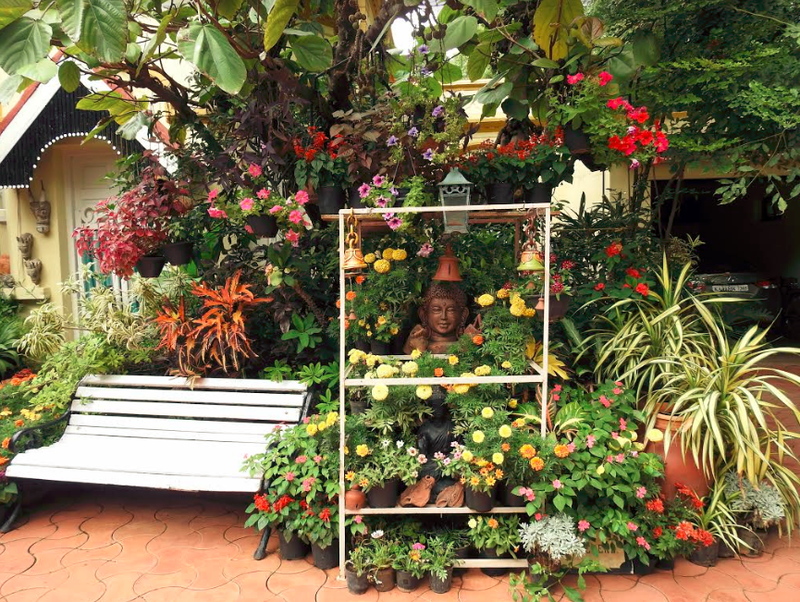 Special mention must be given to the beautiful Buddha stand that has Buddha figurines amidst beautiful flowers. The plants in Priya’s gardens have been sourced from all over the world and are nurtured by her personally along with her able staff. Incidentally Priya says that both her daughters have inherited her green fingers and she is happy about it. Priya’s garden is interesting because she has a variety of plants from ferns, philodendrons, asparagus plants and many species of flowering plants. 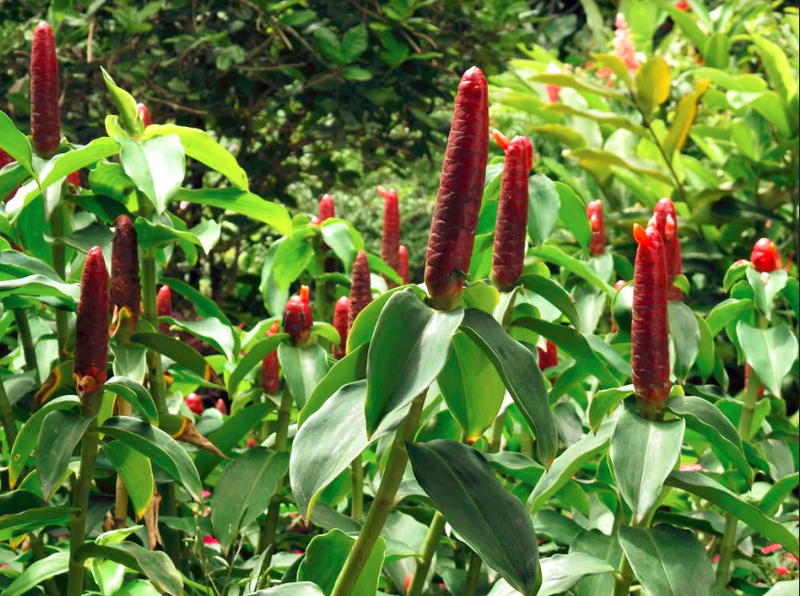 “My signature plants are all heliconias and I have plants from across the world. 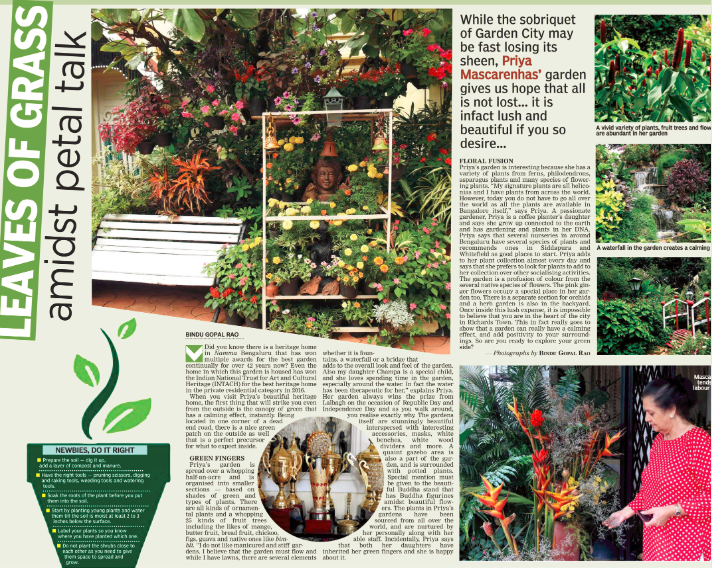 However today you do not have to go all over the world as all the plants are available in Bangalore itself,” says Priya. A passionate gardener Priya is a coffee planter’s daughter and says she grew up connected to the earth and has gardening and plants in her DNA. Priya says that several nurseries in around Bangalore have several species of plants and recommends ones in Siddapura and Whitefield as good places to start. Priya adds to her plant collection almost every day and says that she prefers to look for plants to add to her collection over other socializing activities. The garden has different sections and a profusion of colour from the several native species of flowers. The pink ginger flowers occupy a special place in her garden too. There is a separate section for orchids and a herb garden is also in the backyard. Once inside here, it is impossible to believe that you are in the heart of the city in Richards Town. This in fact really goes to show that a garden can really have a calming effect and add positivity to your surroundings like no other. So are you ready to explore your green side? Choose plants wisely, not all plants grow the same way. It must be conducive to grow in the weather of the place. Plants need to be cared for. They are like children and need to be tended to personally; talk to your plants. Ensure that you research the plant species as you can then take care accordingly – especially the kind of water it needs. Study the plant – how much sun it needs and if it is indoor or outdoor. Use potted plants in small spaces – it is important to add a touch of greenery in your home. The garden size does not matter – you must love plants first and foremost. Understand the plants – some need shade, semi shade or the sun. Dosage of water is important – each plant has different needs as far as the amount of water is concerned. The right amount of manuring can help the plant grow, if you add too much manure the plant will die. Be a humble gardener and that will ensure you never stop learning. Read a lot and discuss with a fellow gardener – you will always get a tip you can use. Prepare the soil – dig it up and add a layer of compost and manure. Have the right tools – pruning scissors, digging and raking tools, weeding tools and watering tools. Soak the roots of the plant before you put them into the soil. Start by planting young plants and water them till the soil is moist at least 2-3 inches below the surface. Label your plants so you know where you have planted which one. Do not plant the shrubs close to each other as you need to give them the space to spread and grow. Thanks Vinod. 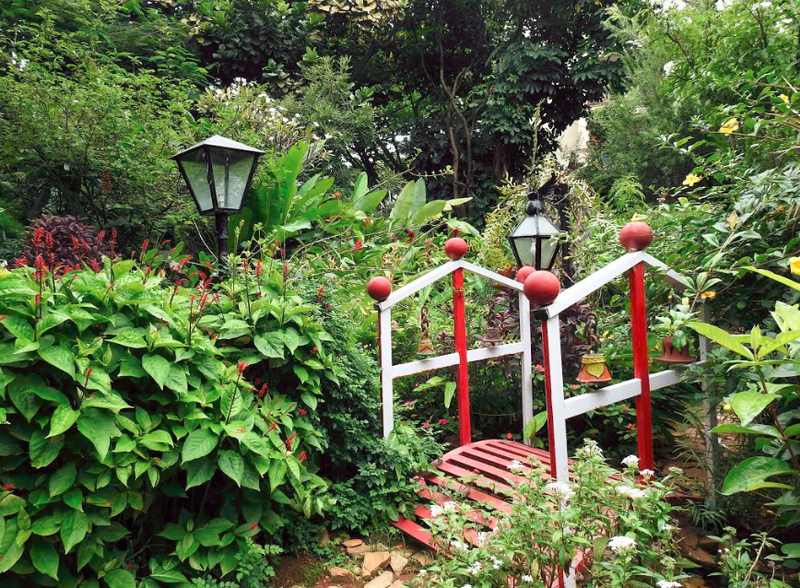 This garden belongs to Priya who has received the award for the best garden in Bangalore for over 42 years now. Indeed there is no other garden like this in the city and it is all her hard work and dedication, I was lucky to meet her and write about it.